Viro is pleased to announce our new grocery produce baskets. 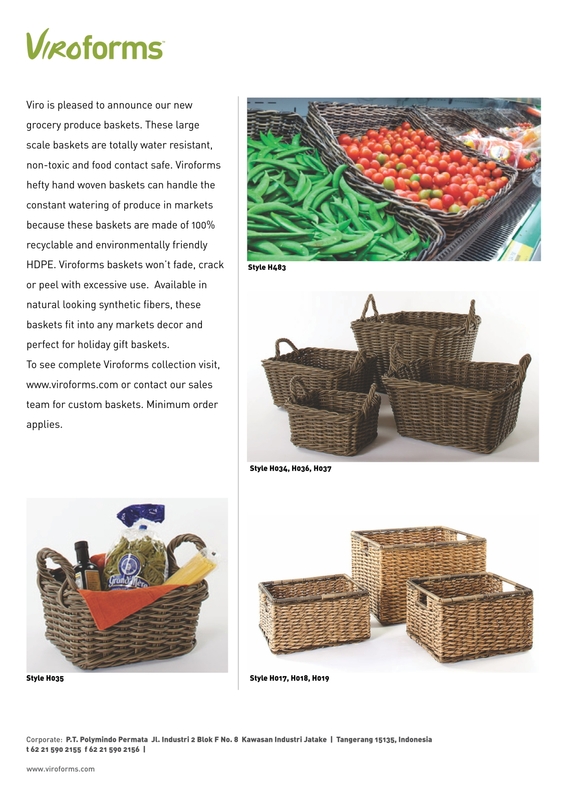 These large scale baskets are totally water resistant, non-toxic and food contact safe. Viroforms hefty hand woven baskets can handle the constant watering of produce in markets because these baskets are made of 100% recyclable and environmentally friendly HDPE. Viroforms baskets won’t fade, crack or peel with excessive use. Available in natural looking synthetic fibers, these baskets fit into any markets decor and perfect for holiday gift baskets. To see complete Viroforms collection visit, www.viroforms.com or contact our sales team for custom baskets. Minimum order applies.